The Prado bed is a stylish faux leather bed frame with attractive stitching detail on the headboard and footboard. The design of the Prado Ottoman in gorgeous dark brown faux leather features an amazing hydraulic gas lift that raises the mattress and base. This bed is really cleverly designed; when the bed frame lifts up to reveal a very useful large hideaway storage space beneath. In fact, the whole of the space underneath the bed is free for storage. L 202.5cm x W 144cm. Internal Storage Dimensions (approx). Flat packed for home assembly. Select above for mattress option. Deep Quilted Spring Flexi Mattress Details. Vacuum-packed into a roll (please allow 48 hours to fully expand before use). Uses high density reflex foam on top of traditional coil spring system for extra support. 20mm high density reflex foam. Dry cleanable double jersey cover. Available in regular comfort only. Anti dust mite features. Made to British standards/ regulations. Firm Memory Foam Details. Vacuum-packed into a roll (please allow 24 hours to fully expand before use). So comfortable, the mattress provides the best support possible to your spine allowing your body to immediately find the best sleeping position, reducing tossing and turning. The extraordinary features helps blood to flow and circulate freely, preventing the nerves and muscles from numbing. If paying by cheque please allow time for it to clear. There will be a discount if this item is collected in person. There may be some recycled packaging used to bring you low P+P costs and to do our bit for the environment. We at Best Beds believe that honesty is the best policy. So what makes Best Beds different from your average online bed store? Some of are products are unique, you wont find them elsewhere. We are constantly looking for the next best thing and new areas to source them. We concentrate on quality of service rather than quantity of sales. 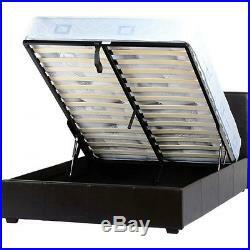 Unlike many online bed stores every product you see on this site is available for sale. We are able to offer this level of service as we are a relatively small company so can respond to all queries very swiftly. Best Beds first started out just 10 years ago by its owner in a small single garage. It has rapidly grown into a family business which is now one of highest rated online bed stores. Despite a small warehouse being built to accommodate our expanding product range we are now looking again to upsize our facilities and expand further still. Best Beds is our livelihood, we enjoy what we do and are always looking to improve and take the next step forward so please feel free to send us your thoughts and opinions. The item “NEW Prado 4ft 6 Double Lift Up Ottoman Storage Bed Brown Leather Mattress Option” is in sale since Friday, April 05, 2013. This item is in the category “Home, Furniture & DIY\Furniture\Beds & Mattresses\Beds with Mattresses”. The seller is “bestbeds-co-uk” and is located in Wells. This item can be shipped to United Kingdom.